Which Stock Option Trading Strategy Works Best? The best stock option trading strategy is one with a high degree of certainty for consistent profits. To achieve this, you should be prepared to accept a profit level that is less than the maximum potential. This is vital. There is a saying among traders that "greedy pigs end up in the bacon factory" and there is no greater temptation when your positions are profitable than to want to squeeze as much as possible out of them before closing out. In many cases, this is where profits turn to losses. If you can master the art of taking some profit and then moving on, you have a far greater chance of success. A Directional or Non-Directional Stock Option Trading Strategy? Next thing to consider is which strategy best fits your preferred trading style. Do you have time and inclination to watch your computer screen all day, or is your lifestyle better suited to just checking your positions for a few minutes at the end of each trading day? When you place directional trades, this means you have a view which way the price action of the underlying is about to move. Your strategy might be simply to purchase calls or puts with target profits and stop losses. But many a trader has been "stopped out" due to market volatility before their options positions then took off in their anticipated direction. It takes a certain mindset devoid of emotion to accept these situations in the belief that it will all average out to an overall profit. Directional plays also include swing trading techniques, following the trend while staying alert to potential reversal signals, debit spreads, credit spreads and some ratio spreads. Because they rely upon a view of future market direction, there is a greater degree of uncertainty associated with such trades and consequently, less chance of profits. A more effective stock option trading strategy may be to use Non-Directional positions. The options straddle and the amazing Victory Spreads are examples of this. However, there are some great range trading strategies that are also non-directional in the sense that they only require the underlying stock to remain within a predetermined trading range for a few weeks in order to realize a profit. 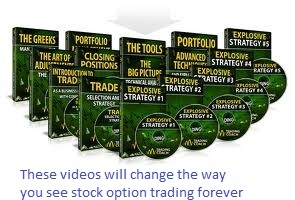 You can explore these on the option trading strategies page. The beauty of range trading strategies, is that profits accrue on a daily basis from what is known as "theta" or "time decay". There is an optimum time to put these on and you should also be prepared to adjust your positions should the price of the underlying come too close to either of your range boundaries. When you set up these positions correctly, your daily profit accrual is guaranteed. It then simply becomes a matter of when you choose to close out for a profit. 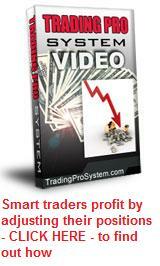 All this is explained fully in the Trading Pro System videos. Once you have seen these and other associated educational material, you won't see option trading the same way again!